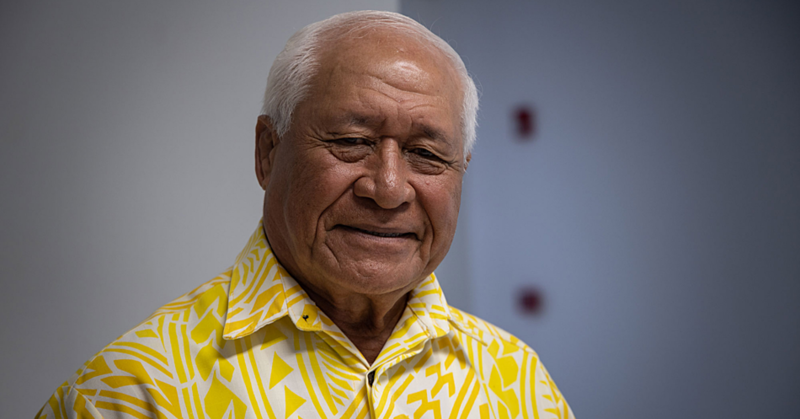 Lawyer and former Manu Samoa midfielder, Eliota Fuimaono Sapolu, has been very outspoken about the developments in Samoan rugby – including the recent appointment of Sir Gordon Tiejtens as the new coach. 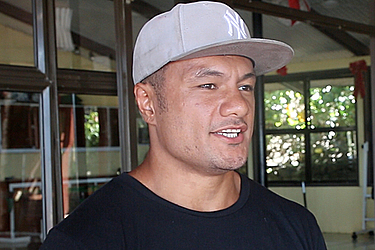 After making the headlines on his views about Tietjens, the 35-year-old set the record straight during an interview with Sunday Samoan that he has nothing against the decision to recruit Tiejtens. Samoa Observer: What do you think of the new Manu Samoa 7’s Coach, Gordon Tiejtens? Fuimaono-Sapolu: It’s very exciting. He’s got some obstacles that he will have to overcome; Samoa is very different to New Zealand but it’s exciting. He’s been in the New Zealand system for about 22 years as a coach and Samoa is completely different. Like New Zealand, everything is geared towards rugby, the media, everything and everyone is all about rugby. Schools are rich; every high school has a professional coaching them. They’ve got awesome facilities, awesome gyms, everything. When you coach the professionals, you’ve got all these people who have come through who are amazing players. You know they start young, and over here, there is no league for five year olds, it doesn’t start until you are in high school when you start competing against each other. The medical facilities are not that good in terms of complicated injuries that the players get. It’s just completely different so everything about Samoa is different which is why it is going to be interesting. Because he has obviously been successful in the New Zealand system and what I saw in Europe when I played for seven years in Europe, was that a lot of All Blacks were bought, and a lot of All Blacks came over and they were average. They were rubbish, most of them are rubbish. Because they are out of that system, even though they are amazing super stars for the All Blacks as soon as they go to a different team with a different way of thinking, it’s not their fault, it’s just different. England is different to New Zealand; Samoa is different to New Zealand. You know people think that it’s going to be a quick success, it could be but, it’s just different in a lot of way. Samoa Observer: Given Tietjens coaching background, are you not optimistic about the future of Sevens rugby at least? Fuimaono Sapolu: I think we are looking at exciting times ahead for our Manu Samoa Team. Especially with Stephen Betham there as the assistant coach, I think that he is very lucky to have him. Not as just a translator but also someone who knows what they’re doing, like he’s done it, he’s been a world Champ and he’s been a world Champ with all locals. I’m pretty sure he coached that team speaking Samoan as well. And with Stephen Betham there, they are very lucky. (He is) one of the greatest coaches in the world right there as his assistant. And you can’t help but be excited. The potential this has is very exciting. Samoa Observer: We understand that even after signing his contract, Tiejtens will not start straight away, which means that he will miss out on the first tournament. Do you think this would be a problem? Fuimaono Sapolu: No. This is a good chance for Stephen Betham. It will be interesting with the selection as well. Are they going with the same players they have there or are they opening up trials again. Will Betham bring in guys that he knows, it will be interesting. I think it’s a good chance for Betham to really show his stuff in that tournament. So I don’t think not having Tiejtens on board is going to be a problem. Samoa Observer: You’ve publically criticised the appointment of Tietjens. Can you elaborate? Fuimaono Sapolu: I have no problem with Tietjens being appointed. I actually like it because it shows how dumb the rule is. This guy coached for 22-years in New Zealand. 22 years and when the price is right, he can change teams tomorrow. And he can go and coach a team that he has no connection to. He is not half Samoan; he hasn’t got a Samoan parent, nothing. But he can go and coach anyone whom he wants. And I have no problem with that. Good on him, go get paid. But the brown player he coaches, plays (for) one second for New Zealand, one second, and he cannot move anywhere else. He has to only play for New Zealand. That’s the problem I have. You’ve got all these older guys who are allowed to go anywhere and collect money and you’ve got the younger guys who are on the field, getting their bodies smashed, getting concussion that are going to stick with them for the rest of their lives, and they are not allow to move anywhere. And these players are like half-Fijians, real Samoans; they have real connections to Samoa. Like Victor Vito for example. He can’t play for us; (I mean) why can’t he jump like how Tietjens jumped? It’s just completely inconsistent. So that’s my problem with the eligibility rule is that these white guys can do it, why can’t Polynesians do it to their Polynesian teams, it’s not like they’re going to play for random teams. They’re Samoan. Julian Savea’s parents are full-Samoan and they can barely speak English properly. They’re real Samoans, why can’t he come and play for Samoa? If Tiejtens can go and do all that, then they should be allowed to also play for Samoa or at least try and get in the Samoan team. I am not saying that every All Black is going to make it because they shouldn’t, I want to see Victor Vito go up against Alafoti, you know what I mean? And raise the standards. So these All Blacks aren’t going to get automatic selection but it will drive everybody to get better and better. And we need that. And you know, they lock these kids in when they’re kids, 19 or 20 year olds, and they’re broke. So if you tell a kid to pick England when you’re broke, when your parents are broke, and you need some money, are you gonna go for New Zealand with all that money or are you gonna go for England where you get $20,000 tala which is $100,000 tala a game? Are you gonna go for that, or are you gonna go for Samoa where you might get $500 tala, which is fine, that’s good money. But which are you gonna go for when you are poor? The thing is, when you are an All Black, or you play for England, you are not poor anymore. So now you make a decision based on who you are. Look I don’t need the money, but I want to do something great for Samoa. So that’s why they should be allowed to come and play for Samoa as well. Because they are not poor anymore. They are gonna make a real decision. But right now with the current system, is easy to exploit. You just dangle some money in front of a poor kid and like all of us, we would go for it. I know I’d do it as well. You know, you go for the money. It’s natural when you are poor. So these guys take advantage of the rule which is why they’ve got the rule. This rule is made my English, made by all those white guys because they know, as soon as we get all the Samoans around the world going for Manu Samoa, going for Fiji, man those guys wouldn’t be at the World Cup, they’ll have to qualify. Samoa Observer: Will you give the Samoa Rugby Union credit for snaring Tietjens despite the competitive offers from the other clubs? Fuimaono Sapolu: Yes. But he’s also got a bit to prove as well. You know as someone who’s been so successful, as successful people, they don’t want to go out and get smashed up by the Fijians three tournaments in a row. He is so used to winning, he is not gonna go out like that. That’s a normal champion. Champions don’t bow out when they are useless. I think the Union did a great job, you know getting Tiejtens not at the highest price, because Tiejtens as well has got something to prove. Or he will feel he has something to prove. Because he has been outsmarted, outgunned by the Fijian teams, who won the last two, tournament series and they won the biggie, which is the Olympics. And New Zealand was nowhere. One win, three losses. So good, if they got him cheap, good, but I don’t think they got him cheap lol. 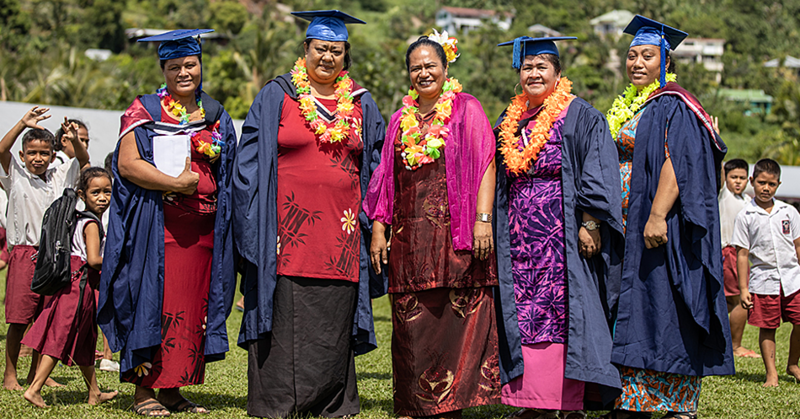 Samoa Observer: Tiejtens doesn’t start until next year; do you think S.R.U. should be paying him now or wait until he starts? Fuimaono Sapolu- So long as the money is not going out, if he’s not working now, then don’t pay him now, it’s the law of business. Like in Japan, your money will start when you are in the country. They shouldn’t be paying someone who’s not here. Samoa Observer: Tiejtens is highly rated around the world and also known for his strict training, do you think this is a good thing for Samoa? Fuimaono Sapolu- About Tietjens strict training, Fiji has shown that you can’t just win on fitness anymore. You’ve got to have something else. Fiji is doing all this stuff, their practices, they are throwing everywhere. You know its different now; the world is caught up to New Zealand, the world is doing all the New Zealand training, the hard out running, everybody is getting fit. What’s next? And that’s another exciting thing. What else have you got up your sleeve mate? Come on Tiejtens, what else have you got? 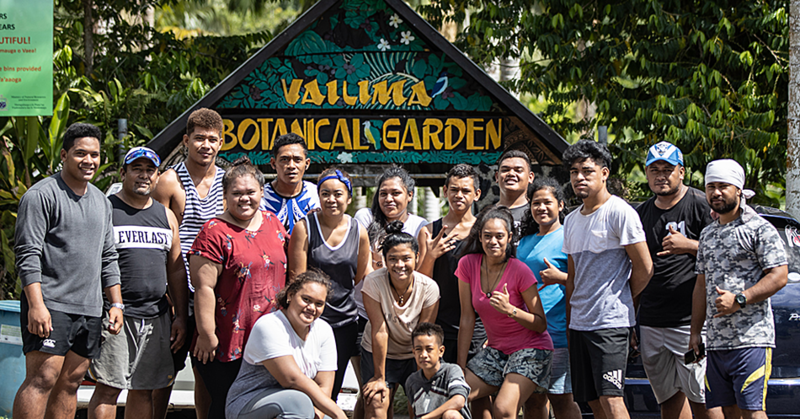 Samoa Observer: What do you think about the development of Rugby in Samoa in general, and what the S.R.U. is doing in trying to bring back the glory days of the Manu Samoa? Fuimaono Sapolu: I don’t know what they’re doing to be honest. So I don’t think it’s fair for me to comment. I don’t know, but the results recently haven’t been too good. We are currently ranked as the lowest Manu Samoa it has ever been. We just had a Sevens team that hasn’t won a tournament in three years, but obviously they won Paris. The 15 starts look like its getting better, but we never know what they have in progress at the moment so I don’t think it’s fair for me to say whether or not what they’re doing is good or not. But from my experience, just my experience from the past, things don’t make sense. So (we should) give him a chance to see where we’re at, at the moment, because we probably need something like this. Hopefully, Tiejtens will bring a 7’s tournament to the Pacific. You know, we are the only team outside of South Africa and New Zealand who have won a 7’s tournament but there is no 7’s tournament in the Pacific. Fiji has won it how many times, three times and the Olympics and Samoa has won it. That’s five big tournaments. England hasn’t won it, they’ve got a tournament. Japan hasn’t won it, they’ve got a tournament. This is lots of money man. Because when you bring a team, they pay for their flights, they pay for their accommodation; they pay for their tourists and all of them to come. Hopefully we can get something like that. And would World Rugby treat him like they treated Damian McGrath and their team sleeping on the hotel floor waiting for their flight to come out. So now it’s going to be excited to see whether they will start to treat us better now that we’ve got Tiejtens. And hopefully he will bring a 7’s tournament here, because that will mean more employment, more money for the people of Samoa. Samoa Observer: Do you think what happened to Damian McGrath might happen to Tiejtens as well if he will not get the right results for us? Fuimaono Sapolu: You know what, I carved up South Africa. I destroyed South Africa and I got cut. And when he (Damian McGrath) was successful and he got cut, that’s consistent with where the S.R.U. is at. It’s got nothing to do with success or with rugby, they just “hmm, I don’t like you” and that’s it. That’s how it goes. But I think it’s different with Tiejtens because it’s Tiejtens man. You know I’ve been doing all these interviews with New Zealand, and they’re like “Hey what do you say about Tiejtens ay? That’s my boy.” They love Tiejtens. So I don’t know. Mind you, the P.M doesn’t really care about what other people say which is good. But I am pretty sure they won’t treat him that way, but man if he is not (going) to be successful, you know how Samoans are they mock aye. So yeah, it will be interesting.